HMH Designs: Pinterest Challenge #4: Happy Composting! Yep...I'm trying to keep on the greener side of things! Since we now have a little garden of our own, we have decided to start composting. I mean why buy compost at Southern States for six bucks a bag, when you can make your own compost with food scraps...right!? Not only will it save us a few bucks on compost, but it will save on us having to take out the trash before it's even full because of smelly food rotting in the bag, in turn saving on the cost of trash bags, and provide us with nutrient rich soil for our own garden. But when I went to click on the link it gave me the Pinterest "Oops I'm Sorry" statement, so I had to go at it all alone [well with the help of my hubby of course]! Step 1: Recycle or buy a plastic bin with a tight fitting lid about 24" tall or taller. Luckily, my neighbor has a stock pile of Rubbermaid bins so ours was FREE! Step 2: We used our hole cutting attachment to make small holes in the top of the container...used here and here. Step 3: We placed dry leaves and/or newspaper on the bottom of your compost bin, filling it about 1/4 full. Step 4: We put dirt on top of the leaves until the container is 1/2 full. Step 6: We spray with water until it was moist, but not soaking wet. Step 7: Put the lid securely on top of the bin and voila! REMEMBER: To place your bin in a shady area. We found a spot for ours under the stairs and so far it hasn't caused a problem. If it starts to smell you can put a little lime in the bin from time to time, but be advised that lime is acidic and is not good for your compost if there is too much in the mixture. Now we just add food scraps to the mixture when we've got 'em and turned it about every two weeks. The more you turn it, the faster everything breaks down. Wow!! What a great way to make compost! You make it look so easy! Thanks so much for sharing at Thursday's Temptation. Good and simple, I like it. It certainly is...and cheap too! I know I commented before, but I just wanted to say Thanks for entering this into the Project Pinterest Challenge too!! Good luck! We are looking at starting our own compost pile and this is a great way to start. Thanks so much for sharing on Tout It Tuesday! Hope to see you next week. This is such an easy way to start composting and cheap too! Tyesha, thank you so much for posting this! We rent our home & for the past four years I wanted to garden but couldn't physically. This past fall they found out what was wrong & now that I'm healed I'm going to slowly landscape my backyard and I wanted a compost pile but my husband complained that it would be too expensive. This will be perfect & I can do it myself! Bless you, Bless you! I'm glad this post was able to help you with your composting! what do you do through the winter months with composting? i live in northern michigan and through the winter i have lots of food to use and lint to throw away so where can i put it so it doesn't stink up an area? You can compost right through the winter. I live in Canada and we just put it in a huge crate outside. It take a year or 2 to compost but it's worth it. 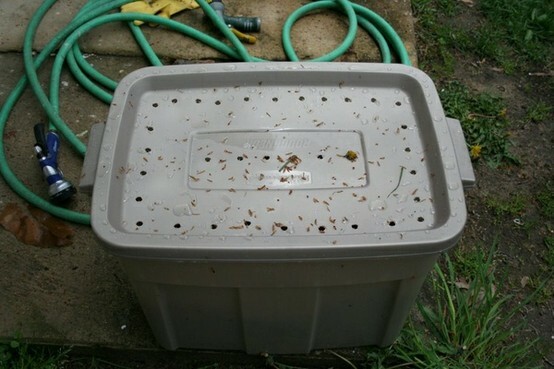 Or you can vermicompost (with worms). But I find our family generates more than the worms can handle. If you add worms, it will compost even faster. And it should be in the sun to maximize time. I've been doing it for years. You don't even need a bin - you can get pallets for free pretty much anywhere and put them together to form a large crate. Make sure you are layering paper/fiber products with the food. This seems so easy to do, thank you for sharing. I am just wondering why it's not in the sun and you put it in the shade instead? Is it because there is no manure, so it's not a 'hot' compost? You can add shredded up newspaper on the top to keep down the smell also.